Godaddy is the one stop shop for all your website solutions, right from website builder or web designing to hosting services and more. Avail their fast and reliable plans from blogs to high-powered websites. Choose from Economy, Deluxe to Starter packages depending on your business needs. 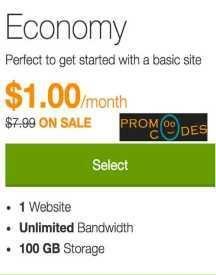 You can host a single website with Economy plan or multiple websites with Deluxe, Premium, Unlimited or Ultimate plan. And, look like a world-class business with the professional email powered by Microsoft. With the massive offers on Godaddy services, you can save immensely. Now, it's time to take your business online. Have a happy online presence! Thinking of setting a personalized email account for your new business idea? Why wait! Make your big dreams come true by using services offered by India’s largest domain name and web host registrar - GoDaddy. This portal offers a wide range of services to its users who are looking to have a strong professional presence in the digital space. 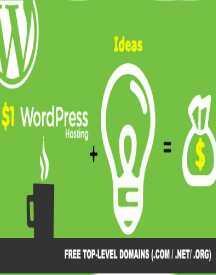 They offer web hosting service, domain name registration, website builders, several e-commerce cart applications and more at unbeatable prices. Their discount offers are incredible and their services can be easily managed from anywhere. You can manage multiple domains hosted using their service using DNS control and server management. Usage of their service is quite simple. For example, if you would like to purchase a domain in GoDaddy, all you need to do is search or browse, track, purchase and you can also bid at GoDaddy auctions market place. Whether you want discounts on domain registration services or looking for tools that help you in building a website, to use shopping car services or in general tools that help you succeed online, you have come to the right place. 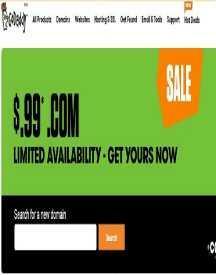 HappySale brings latest GoDaddy offers valid on all their products and services on this page. Browse the many exciting offers, pick the best one that matches your needs and requirement. 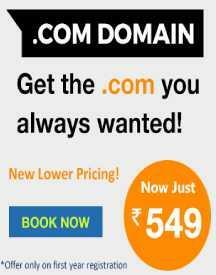 Here are some of the popular promotional offers available at GoDaddy - Rs 125 .Com sale, Rs 99 web hosting, Rs 199 .In domain names and more.